A recent post by Barbara O’Brien pointed me to a great article by Jane Iwamura, “On Asian Religions without Asians.” A commenter asked O’Brien for her related thoughts on the upcoming Buddhist Geeks conference. In her response, O’Brien mused, “And are there any Asians at all in the line-up? It’s almost Exhibit A of what Jane Iwamura is talking about.” I had to check it out for myself. 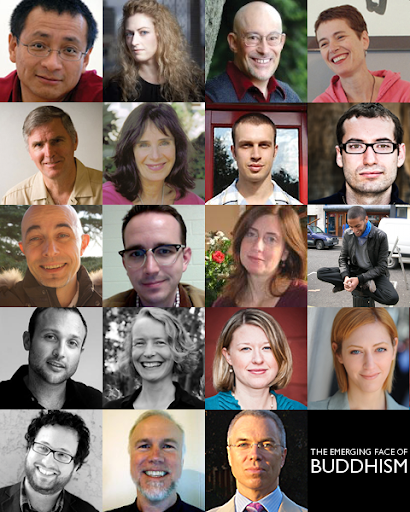 Taking place July 29th – 31st, 2011 in Los Angeles, Buddhist Geeks | The Conference brings together some of the most exciting teachers, leaders and thinkers from the US and beyond as Buddhist Geeks continues its ongoing mission to discover the emerging face of Buddhism. With a vibrant program of presentations, workshops, performance and participant-led elements and its inclusive non-denominational attitude, #bgeeks11 will be the most innovative, energetic and relevant event in the Buddhist world. We would love you to join us. Following up on O’Brien’s comments, I went to the Buddhist Geeks conference page and pasted the photos together into a composite graphic, not unlike the one in this post from over two years ago. Voilà. A picture is worth a thousand words, I’m told, and hopefully at least this one is. I’ll be in transit for the next twelve hours, and I’m going to be too jet-lagged and sleep-deprived for a more eloquent post. There you have it: the emerging face of Buddhism (conditions and restrictions apply)! The yoke of dharma moves in mysterious ways. How many Indian's were at the monasteries in Tibet at the time of Atisha? Or in Japan at the time of the 3rd Patriarch? This US event is bound to be dominated by American faces, I'm just glad a few Europeans are going to make it. And, gosh, is that a European Asian face I see in Rohan? I think it's important to define "American" faces. America is a different animal than Tibet or Japan may have been back in those times... A typical American is not necessarily a middle-class white male... A typical American can be anyone of any descent or ethnicity... black, white, Chinese, Korean, Cuban, Puerto Rican, Mexican, Japanese, etc., etc. So the emerging face of Buddhism is ... not Asian? Part of it also subtly states that Asian Buddhists are not progressive. I don't think this is true and Buddhist Geeks could have been more representative. Arun, you might find my post on this same topic to be of some interest. You're mentioned and linked to. @michaelrose "This US event is bound to be dominated by American faces"
But no American faces of Asian descent? Americans faces are only white? I am too old to be the emerging face of anything except . . . death. But seeing that face is what brings us to Buddhism, and allows us to smile. I appreciate your perspective here as a "minority" voice actually representing a majority of American Buddhists who are Asian. Obviously there are numerous strains of Buddhism in the West, and this conference largely represents the privileged mostly-white version of which I am a member. But it is important that I and others in my group recognize our privilege and deal with the issue instead of assuming our group's perspective is the right, true, or only one. One concession we should make here I think is that 7/11 of the teachers are women. In the history of Buddhism (as in Christianity and pretty much all other religions), there have been very few women represented as teachers or Buddhas. So perhaps in one way this is a step forward, even as American Asian Buddhists have been left out and remain ignored at present. As an Asian British Western Buddhist Buddhist-Geeks Attender Speaker Organiseer I thought I'd best join this conversation. This is clearly a contentious issue so I respect everyone's opinion but I'd certainly second Vince's point about how BGeeks very much has an angle on Western Buddhism moving past traditions and the speaker roster reflects that. As @Arun rightly points out - the blurb says that the conference "brings together SOME of the most exciting teachers, leaders and thinkers from the US and beyond". I think this is a difficult point to argue but they are clearly only SOME and there are many other brilliant voices - from Asian backgrounds and elsewhere. As someone in the European Dhamma scene, this is a fascinating issue to observe since I think there is probably quite a difference of how important this issue is either side of the Atlantic. My very personal experience is that very few Buddhist conferences actually cater to MY needs - a digitally savvy, young(ish), urban, non-monastically inclined yet committed, second generation Buddhist interested in innovation and asking new questions. Buddhist Geeks | The Conference I think will actually be one of the only major events that speaks to me and I for one am excited to attend. And the reason I wanted to be part of the organising team. I'd love you to join me but if you can't then that's ok too. I share AABs dismay. That is the whitest McWhitey white line up outside of a Republican convention. I also wonder about the economic status of conference goers. Seeing just white middle to upper class Buddhists can feel aliening to someone who otherwise might be interested in Buddhism. It makes me more appreciative of belonging to SGI-USA.